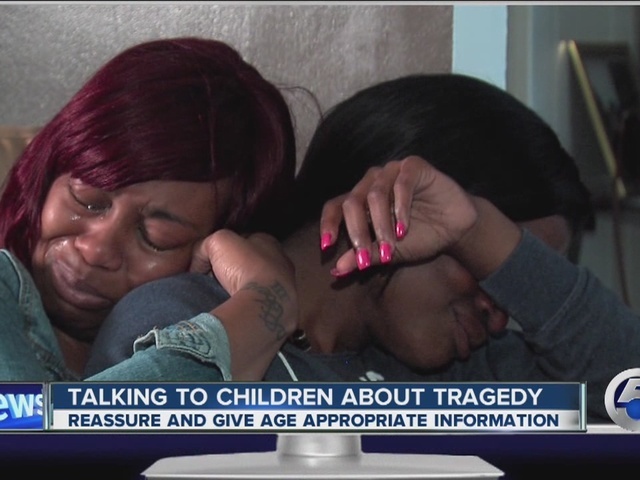 Young children may see news coverage of a tragedy, or hear about it from friends at school. And when parents are confronted with questions about events such as the recent shooting deaths of children in Cleveland, how much should parents say? 1. Answer in an honest and age appropriate way. If a child asks why someone did something, we don’t always know and it’s okay to tell them that. 2. Generally, it’s best to wait for a child to ask about an event, rather than bring something up that may not be on their mind. 3. If kids do ask about a disturbing event, ask them what they know or what they’ve heard about it. That will provide a good starting point for the conversation. 4. The Academy of American Pediatrics recommends only providing basic information to help children understand the situation and leave out unnecessary details that may frighten them. 5. Children won’t benefit from seeing graphic details, images, or sounds – so limit their media exposure. 6. Overall, reassuring a child of their safety is a top priority. You know your child best. If you notice a change in their mood, appetite, sleep patterns or behavior, talk to your pediatrician.